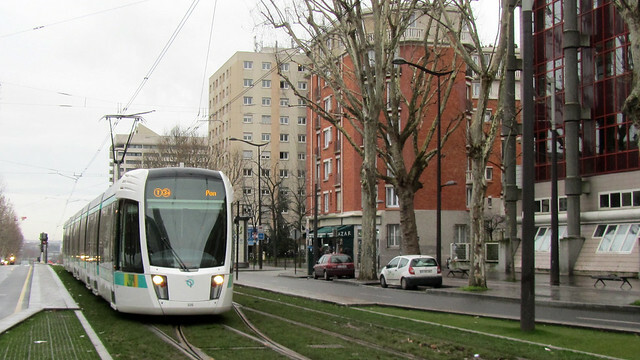 The rule with taking the tram is, on boarding, validate a ticket or the Navigo using the machines inside the tram. However, this essentially creates a no-barrier system to get on or off the tram, making it a pretty good “free” hop-on, hop-off service for the fare cheats. The sketchy ones can keep an eye on potential inspectors ready to board at a station and get off while the inspectors board, if any are spotted, preferably via a different door. I have yet to see people getting caught out on trams up to now. Then again, I don’t use tram that often and have only been ticket-checked once. Still, this is undoubtedly the easiest among the various modes of public transport to take a free ride on. By far my preferred mode of transportation, I use buses on a nearly daily basis. On a standard bus, everyone’s supposed to get on the bus from the front and off from the back. In general, there are two Navigo validators by the front doors, and a paper ticket validator just after the driver’s “compartment”. On certain routes that deploy long buses (i.e. two bus length, like lines number 27 and 91) there are two more sets of ticket validators by each set of the doors at the back. All in all, there are three entries and two (back) exits for the long buses. You’ve guessed it – it is easier to get on the long buses and not pay for a ticket, since all passengers may use any of the doors to board the buses. It is a bit hard for the driver to keep track of ticket validation all the way through to the back. That’s not to say I haven’t seen people who blithely walk past the ticket validators in standard buses either (who cares if the driver is seated just right there), and some would even try to sneak on the bus from the exit door. The latter scenario is also when you are most likely to hear the bus driver putting through an announcement along the line “all passengers are reminded that their ticket/Navigo must be validated”. On one occassion, the bus driver even refused to drive until someone he spotted to not pay a ticket came forward and had a ticket validated accordingly. I have seen people being fined on buses on a number of occasions. Given the limited number of doors on a bus, the inspectors would split among themselves and board from all entry/exit doors. If you want to get off, you better flash a valid ticket or you could be stuck for a lot longer, waiting for a fine to be issued. And risk actually missing the wanted stop. 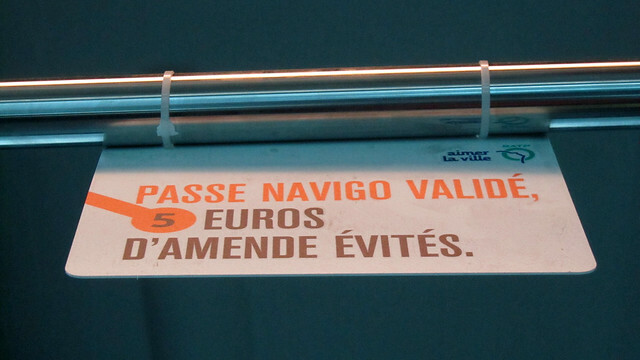 Entry to the métro network (and exiting the RER too) requires ticket/Navigo validation in order to pass the barrier in place. Some stations have simple turnstile only, while other have turnstile plus a small “door”. On a couple of occasions when I suspected someone’s hovering and waiting for an opportunity, I’ve managed to prevent such free ride by pushing the turnstile ahead of me but not move into the space until the metal bar reaches the back of my bottom. That leaves no room for the person behind to squeeze in, and I feel better having not only save myself from unasked-for body contact but also thwarted a fare evader, even if just for a minute or two since the person will invariably just find another victim. 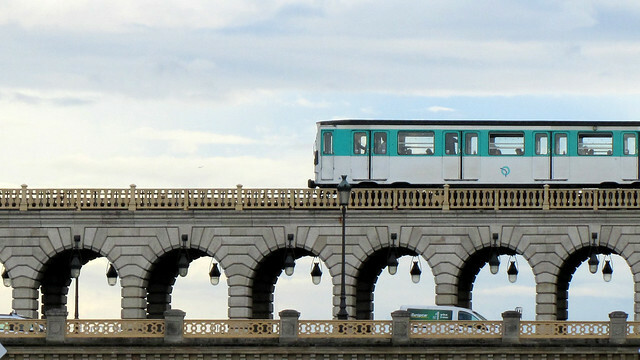 The way the inspectors catch the culprits on the métro or the RER is by setting up sting operations in unsuspecting passageways leading to the trains. By the time one turns into the corner, it is too late. Show us your ticket! The cost of using public transport in Paris is actually cheap in comparison to many other European cities that I’ve been, so I find it hard to understand why would anyone not pay his/her fair share for the use of the extensive and relatively well-managed public transport network. For the frequent users, the monthly Navigo pass rate for Paris (zone 1-2) is very reasonable, averaging about €2 per day, which is less than the price of 2 tickets bought as part of a carnet. For those who work, employers typically cover half the price of the monthly Navigo. For students, a special rate is available. For those in hardship and cannot afford the standard rates, an application for reduced rates is possible. Be fair, pay the fare.